The Cognac Geographical Indication has teamed up with Good Passports to offer a taste of classic cognac cocktails at the Mission’s top mixology bars. Produced only in southwestern France and one of the world’s most famous spirits, Cognac is the originator of many classic cocktails, ranging from the French 75 to the Sidecar. At each of these bars, you’ll have the opportunity to taste a rendition of a classic and experience why Cognac captivated the stirrers and shakers of the world’s first cocktail-makers. In addition, a portion of the proceeds will go towards Heritage Radio Network, which is the world’s pioneer food radio station and runs 100% on the support of its members and community partners. It was founded by Heritage Foods USA, which aims to preserve endangered species of livestock from extinction. By purchasing a ticket, you’ll get one cocktail at each location, along with a custom tote bag and information on how Cognac came to be the backbone of the classics. In addition, each purchaser will have the chance to win a private Cognac education for 2 with a certified Cognac Educator, with the opportunity to learn how to create two classic cocktails (1 winner only). Five purchasers will have the chance to win a $50 gift card to Cocktail Kingdom, to stock their home bars. The Cognac Crawl Passport gives you access to top cocktail bars such as Blackbird, Dalva, Elixir, Holy Water and Wildhawk. Pick up your ticket and tote bag at Elixir any day from September 15 through October 14, 2017. 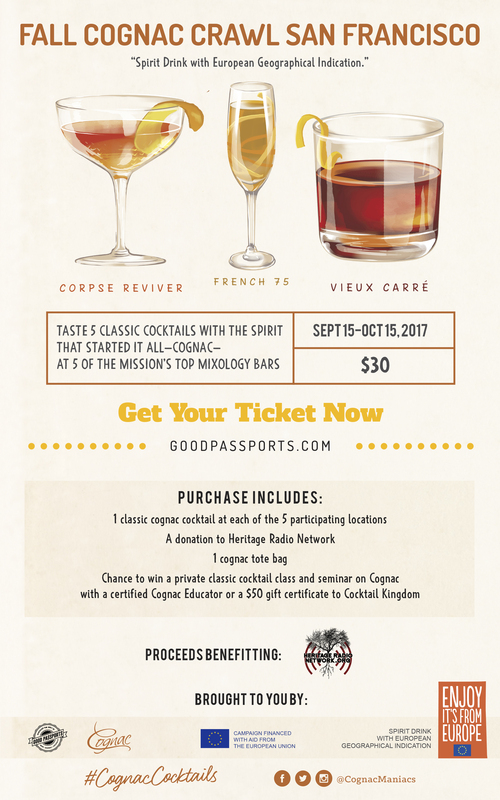 Bring your ticket to each of the 5 participating locations any day from September 15 to October 15, 2017 and savor your cognac cocktail. Blackbird: A neighborhood watering hole, Blackbird offers a creative and seasonally-rotating selection of cocktails. As if that wouldn’t keep anyone coming back for more, they also offer billiards, a photo booth and a friendly welcome at this Market Street spot. Dalva: Good music and good classic cocktails are a central element of this cozy and eclectic bar’s wheelhouse. Located on 16th Street between Albion and Valencia, their offerings are streamlined, with each cocktail a total knockout. Elixir: Elixir is a neighborhood bar that has been serving its neighborhood for as long as there has been a record of the corner of 16th and Guerrero Street (1858). Behind the stick at this classic saloon you’ll find friendly bartenders, an amazing selection of spirits and beers and some of the freshest cocktails in the city. Holy Water: With its religious theme, Holy Water is a relaxed tavern where believers can come to worship at the alter of a well-crafted classic cocktail. Located on Cortland Avenue in Bernal Heights, the menu of classics is quickly rotated. Wildhawk: Spirited, lively, and a bit bohemian, Wildhawk is brought to life by its cast of notable industry veterans who embrace the art of hospitality as much as the art of making a fine cocktail. The menu features cheeky cocktails with personality, including a range of vermouth-inspired cocktails, plus beer, wine and bar snacks to accompany your libations. Cognac is a Geographical Indication located on France’s Atlantic Coast, 75 miles north of Bordeaux. The Cognac region and its resulting spirit—produced from wine—both take their name from the namesake town at its center. Defined by its maritime climate, clay and chalky soils and the Charente River crossing the length of the region, Cognac’s history as a spirit-producing region dates back to the 16th century, though its wines had achieved notoriety three centuries before. Created in 1946, the mission statement of the BNIC is to develop Cognac, representing and defending mutual professional interests of both growers and merchants. The BNIC is responsible for organizing the production of Cognac and respond to market needs; informing about, protecting and promoting the Cognac appellation; facilitating access to markets; furthering relations between merchants and winegrowers; recording sales and exports; administering the aging control system; issuing authentication certificates for exports; and acting as the official body that and safeguards the Cognac appellation. It is made up of 100 staff members. In 1909, the Cognac area of production was delimited, and in 1936 it became an AOC. In 1989, the Cognac appellation was recognized as a Geographical Indication by the European Union. Good Passports work with bars, restaurants, breweries and alcohol retailers to drive in customers by creating limited-time promotions with multiple venues. Customers acquire a Passport that guides them around a city where they get to sample various drinks at a number of different locations. By purchasing a ticket, customers also receive a periodic email newsletter alerting them of cool and exclusive events from the participating locations. The content of this article represents the views of the author only and is his/her sole responsibility. The European Commission and the Consumers, Health, Agriculture and Food Executive Agency do not accept any responsibility for any use that may be made of the information it contains.